Written by two mates of mine and fellas I hold in very high regard and look up to a lot 'A Hard Day's Month' is a stunning read. It's hooks you right from the off with similarities to everyday life and speaks to you through everyday situations that you too, find yourself in. A story that instantly immerses you is always going to be a good one and 'A Hard Day's Month' is no exception. Cynthia is an incredibly complex character who's younger life revolved around The Beatles a band who stole every young teenagers heart in the sixties right up until 1970 and changed music forever. Harrison is her favourite and 'A Hard Day's Month' begins with Cynthia finding out the devastating news of George's from her best friend Sandra. This is news which completely shakes and shocks Cynthia to the core and you get a real idea of her character during this ordeal. It's the kind of opening that sets the tone for a entertaining plot that will have you immersed instantly. Anyway back to the book and there's so much to talk about I couldn't possibly tell you it all without ruining it for you. 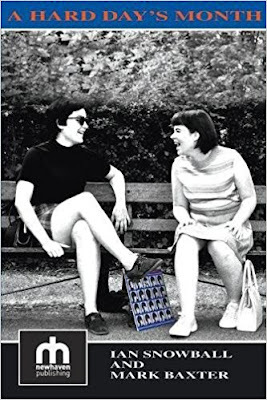 The plot takes you on a journey as Cynthia and Sandra follow The Beatles everywhere in an attempt to get their 'A Hard Day's Night' LP's signed by the fabs. The book keeps you in the palm of its hand as a reader and opens you up to the world of two Beatles-mad teenagers. It urges you to keep on reading and the old cliche of, 'You just can't put it down' springs to mind. There's brilliant moments where the writers take you back to the heart of the girls teenage years in the 60's. These moments capture the sights, sounds and smells of the period perfectly and paint parallels to the likes of the main characters from The Who's rock opera Quadrophenia. The characters you meet during throughout the plot are meticulously detailed and come to life in every aspect. 'A Hard Day's Month' captures the era perfectly, from the girls in mini skirts to he fellas sporting Beatle esque haircuts and clothing it's all in there. It drags you back to a much simpler time when everyone was into clothes and music compared to it just being the sussed few nowadays. The plot takes you on a unique journey and really brings out all your emotions. for writing to draw emotions from the reader it has to be good, trust me! You will laugh, cry and live every little happening with Cynthia and Sandra as they go on this coming of age voyage. Bax and Snowy have done a fine job and have once again produced a brilliant piece of work which should be on every sussed man or woman's shelf. Get it read, yeah? !